It is Election Day. I don’t know about you, but for me, the campaign has been too lengthy, too unpleasant, and not informative enough about meaningful issues. 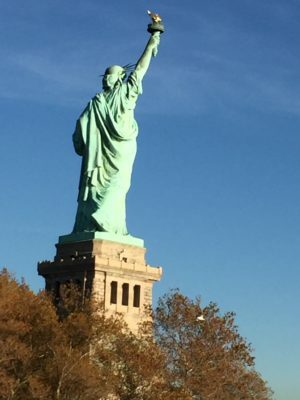 a beacon of hope, of strength, and of light to so many: Americans, soon-to-be/Americans, and visitors from all over the world. The weather is warm, the blue sky cloudless. There are many people filling the ferry, the plaza, the pedestal. I am aware of the multitude of languages, of dress, of facial features, and of skin color. 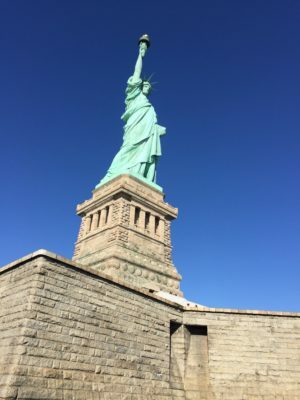 And nearly everyone is taking photographs of Lady Liberty, her copper robe brightly lit by the sun, her golden torch held high above her head, beaming brilliantly. I feel emotional at the pleasure of her company, what she represents, a welcome symbol to all, irrespective of class, culture, religion, and race. On this day especially, I want to work to be open-hearted and open-minded, to be respectful of others whose views are different from mine, and to try to gain a better understanding of their beliefs. Thanks, Adele, for your thoughtful remarks! It has been an exhausting election season for all of us. “Things do not change; we change”.